The Semovente 90/53 was a heavy Italian self-propelled gun and tank destroyer, used by the Italian and German Armies during World War II. It was created by mounting a 90 mm Cannone da 90/53 anti-aircraft gun on top of an enlarged chassis of a M14/41 tank. Only 48 of these vehicles were produced, all in 1941. This low production was due to Italy’s limited industrial capability at the time, as well as high demand for the 90 mm gun for regular anti-aircraft duties. 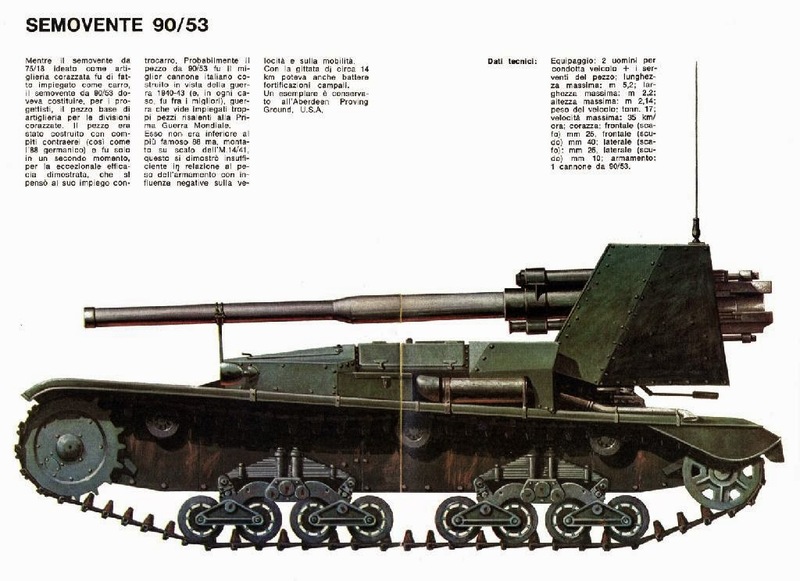 The Semovente 90/53 was primarily developed in response to demands by Italian forces on the Eastern Front for a vehicle-mounted anti-tank weapon that could take on Soviet T-34 and KV tanks. Italian armored forces on the Eastern Front were equipped only with the L6/40 tank and Semovente 47/32 self-propelled gun; neither of these had the firepower to cope with the Soviet medium and heavy tanks. However, no Semovente 90/53 were ever sent to the Eastern Front. The major drawback of the Semovente 90/53, as with many self-propelled gun types of World War II, was the open top and rear of the gun compartment, which left the gun crew exposed to shrapnel and small arms fire. In addition, the Semovente 90/53 had little or no armor in most areas. Because these vehicles were designed to operate far enough away from enemy vehicles to not be subject to incoming fire, this was initially not considered a problem. The small ammunition capacity of the vehicle was also a problem; only six rounds could be carried. This necessitated the creation of special ammunition carriers out of Fiat L6/40 tanks, one accompanying each Semovente 90/53 in the field. The L6 ammunition carrier itself carried 26 rounds along with an additional 40 rounds in a towed trailer. It fired Effetto Pronto, or HEAT rounds, which could pierce 70 mm armor plating at a range of 2,200 meters. None were ever sent to the Russian Front. In the North African Campaign, the Semovente 90/53 proved to be an effective weapon and its long range was well suited to the flat and open desert terrain. 24 Semovente 90/53s saw service against the Allies in the 10° Ragruppamento Semoventi, which was stationed in Sicily during the Allied invasion in 1943. Following the surrender of Italy in September 1943, the few surviving Semovente 90/53 were seized by the German Army, but were of little value in the mountainous terrain of Northern Italy where they operated. As a result, most finished their careers as long-range artillery. This entry was posted in AFV, Italy by MSW. Bookmark the permalink. With only 48 built, was the 90/53 concentrated in specific tank destroyer/artillery units, or dispersed amongst a wide range of Italian and then German units?